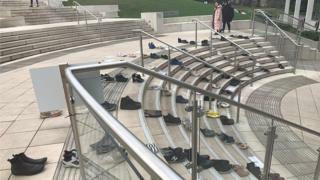 Empty shoes have been left on steps at a university to highlight the number of student suicides in England and Wales. The 95 pairs, at the University of Nottingham Students' Union, reflect the students who took their own lives in 2017/18 across the two nations. The display is part of the union's Suicide Awareness Week, which ends on Friday with 95 seconds of silence. A petition asking the university for more mental health support has been started. The students' union said its dedicated support line - Nightline - had taken 592 suicide-related calls in the past three years. Zoe Mackenzie, the union's equal opportunities and welfare officer, said this showed the university had "a significant problem". However, she added: "The university does not publicise any student deaths we have, meaning any student suicides we do have tend to fly under the radar." The union's petition asks for more funding for counselling services, better systems for picking up issues and better mental health training for staff. A University of Nottingham spokesman said it invested more than £1 million each year in its mental health, counselling and pastoral services. He said: "Our health and wellbeing strategy sets out how all staff members have a role to play in supporting students' mental health and we are rolling out mental health first aid training across the whole institution. "We work closely with the Students' Union, who are a key partner in supporting students' welfare, whilst they are at university and we look forward to working with them on the campaign and the points the Students' Union have outlined." If you are worried or need any advice on any of the topics discussed in this article, go to BBC Actionline.